This past week has been an astounding and remarkable journey through the pages of Hogan's Hope during which I was blessed to have had the amazing opportunities to talk with wonderful people who love their animals. We came together in different ways, as different individuals, but joined in our belief to accept any of these differences with love. 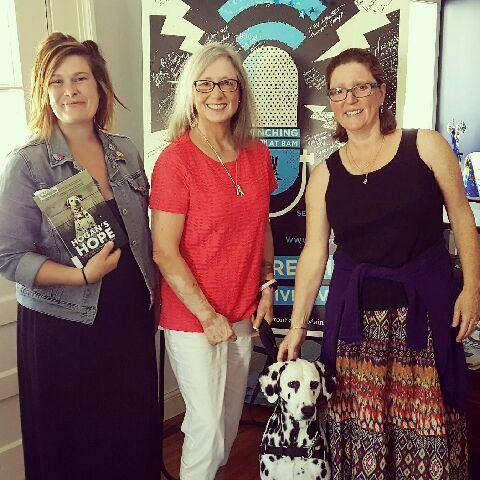 My first adventure was the beginning of a week-long book club discussion with the members of 2 Traveling Dogs Fans! Laurie Duperier, the author of The Endless Path, is the group's book club facilitator who approached me back in March. What a humbling honor to discuss my book, Hogan's Hope! Each day we focused on different topics that emanated from the pages of the book. On the opening day of this very special time, for instance, I posted a video of Judea and me walking down our long, dirt driveway and thanking everyone for deciding to share in Hogan’s courageous journey and his message of hope. Fans were invited to share their thoughts on how their own dogs might be hoping for something or what their precious four-legged family members have taught them. Every day was filled with revealing feelings, ideas, and revelations. A couple of the members candidly admitted that they had never thought of their dogs hoping for anything. What a grand time of learning so much of what our non-verbal family members have and can actually teach us. Thought: Do you believe that a dog can teach us how to hope? What are your thoughts on that? Would you share with us some examples of what your dog has taught you? Each day became better than the one before, and Coco, the parrot, even joined us for some input! Judea and I (with the help of Jim, our wonderful papa and husband) posted a video to open the day's topic and discussion. I was extremely rewarded with great friendship, powerful feelings, and increased hope. THEN.... off to do a radio interview at iCRV radio, (www.iCRVRadio.com), with Kate, Gwen, and LRB for The Library Chat. What a fantastic program with three dynamic and talented women who produce a show that is filled with great information, warm feelings, and thought-provoking ideas and comments. We spent a half hour talking about Hogan's Hope, deaf dogs, animals in general, and how each non-human family member is so important to our lives. "First, each of us has a story to tell. Throughout our lives, from childhood to adulthood, we are drawn to stories. It’s what connects us... 'stories link lives'. Second, we’ve all experienced setbacks and challenges. Loss of a job, loss of identity, loss of a loved one, etc … I want people to know they are not alone and that there is hope/light. It brings me so much joy, if/when I’m able to ‘lift up’ someone or empower them. My goal is to provide a service that brings inspiration, hope, and empowerment through the power of stories." I was again able to share that Hogan taught me how to hope and why animals have touched my life in such powerful and positive ways. Enjoy your week, dear followers. Our lives have great and wonderful stories to share. Share, share, and share some more. God bless!